(From left) Jens Staff, Beau Janke, Soren Staff and Michael Aschbacher form the Eau Claire-based band Them Coulee Boys. Submitted. Summer camp is a magical place for many people. When you’re there, surrounded by your peers and isolated in a natural setting, it’s almost as if reality is suspended. It’s a place to make fast friends and unforgettable memories. For Soren Staff and Beau Janke, camp was the place where their friendship and their musical partnership began. Janke had taken banjo lessons and Staff was a self-taught guitarist. During their down time, they came together to play. The following summer, Staff’s brother Jens worked at the camp as well, bringing along his mandolin. In 2013, after a summer of strumming and singing together, the trio recorded an EP under the name Them Coulee Boys. The final band member joined the crew in 2014. Michael Aschbacher was another friend working at camp who jumped into the fray as the band’s rhythm section, playing both bass and kick drum. The band is still actively involved in the summer camp scene, though their counseling days have gone. 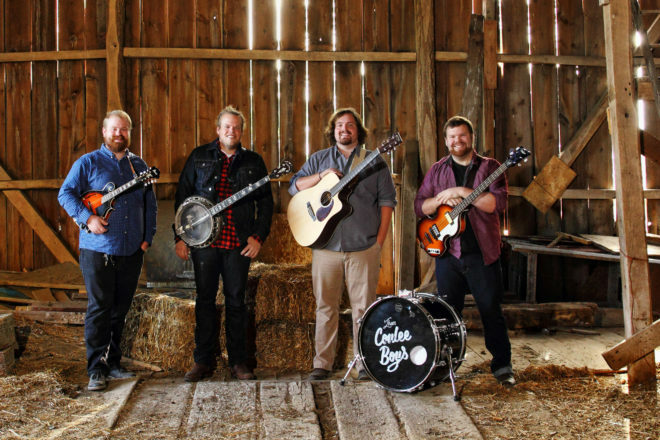 In partnership with local churches, Them Coulee Boys has put on a few concerts to raise funds for campers. Half of the proceeds from these performances go toward paying tuition fees for future campers. The last of these fundraising events, which took place earlier this year, raised more than $1,000. “It’s really great knowing we’re having a positive effect on children’s lives,” Soren said. Them Coulee Boys released their first studio album, Dancing in the Dim Light, on June 28. For their first album, I Never Lied About Being in Love, the band chose to record themselves, but opted this time to record at Pine Hollow Audio in Eau Claire. In addition to an expanded instrument lineup, Soren explained the writing for Dancing in the Dim Light has grown up, making for a more complex album overall. Another challenge for the Americana band was adjusting to a professional studio setting. Along with their first studio album, the band filmed their first music video for “The Mask,” a track off their latest release. The short combines the seriousness of a country western standoff with sub sandwiches, incorporating the goofy humor that the band members are known for. So what’s next on the docket for the foursome? They are currently in the process of transitioning to a full-time band and looking ahead to their next album release. 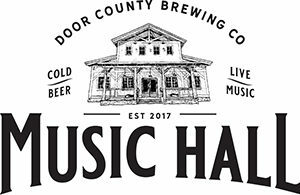 Them Coulee Boys will perform at Door County Brewing Co. at 7 pm on July 16.